I’ve always had a soft spot for a Series II. The one I really, really wanted back before I was even old enough to drive was a 109″ Station Wagon. The idea of getting one didn’t really turn into actually looking for one until 18 months ago or so. I was mostly driving an ’86 90 at the time, having taken my trusty Discovery off the road. The 90 was less than ideal for going away biking, camping etc as space in the back is pretty limited. I missed being able to sleep in the back as I had done with the old Disco, so I fancied getting an SII 109 or very early 110 (for some reason I find SIII’s completely unacceptable…) I looked at a few but most were either utter sheds or going for crazy money. Or both. After a while, a chance search on carandclassic showed up a ’71 IIa 109 station wagon locally. This was a bit of a novelty, as usually the interesting-looking ones are miles away. I went for a look, not expecting very much as the pictures on the ad weren’t great. 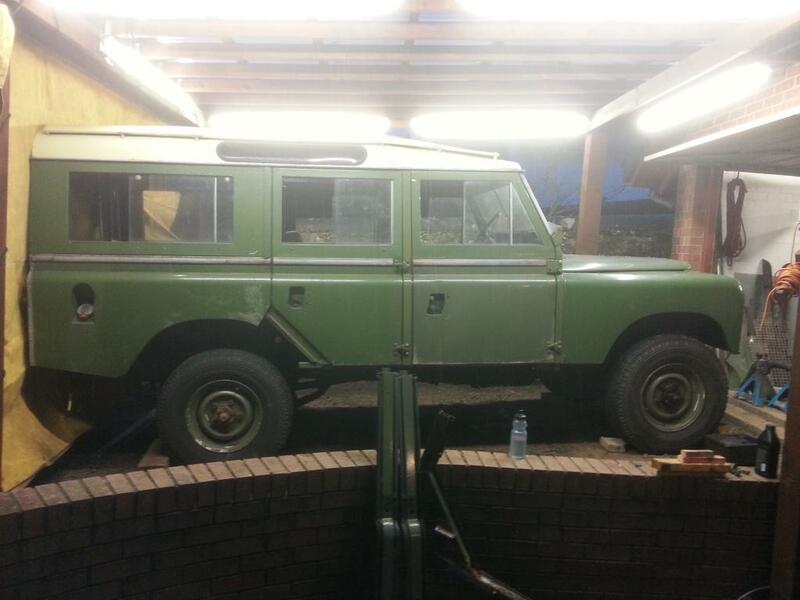 It had been on the road until failing it’s MOT a couple of months earlier for a few reasons, primarily corrosion. Turned out it was actually pretty good, save for a very ropey-looking chassis and similarly crusty side frames. The side frames are unique to the 109/110 station wagons, they are one piece and run from the bulkhead to the back of the rear doors. They form the sill, b-pillar and part of the c pillar, basically bridging the gap between the tub and the bulkhead and providing somewhere to mount the 2nd row doors. 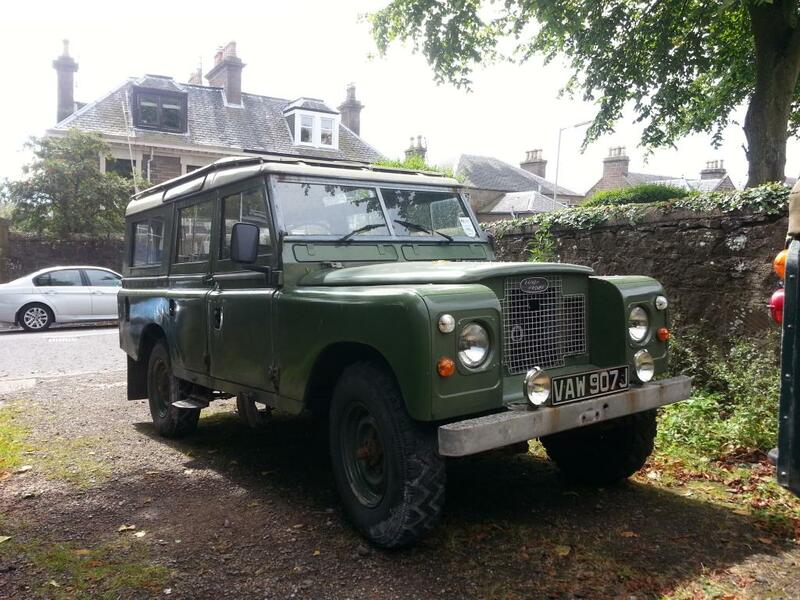 The original 2.25 petrol engine had been swapped for a Range Rover 200tdi, but other than that it was mostly present and correct. 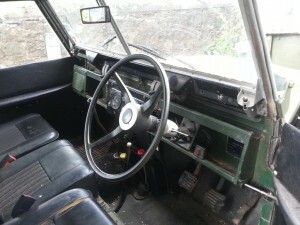 The interior trim was all there, the roof vents worked, the body was pretty straight, bulkhead good… A few bits were wrong – it had series III upper door hinges (commonly done to fit door mirrors in place of the original wing mirrors) and Wolf wheels. It had also been repainted at some point, but it wasn’t the worst job I’d ever seen. I was planning on using it rather than polishing it so that wasn’t hugely important anyway. The price was (almost) right, so a deal was done. Once I got it home and had a closer look, it was pretty obvious that a chassis swap was the best course of action. The rear half in particular was very rotten. 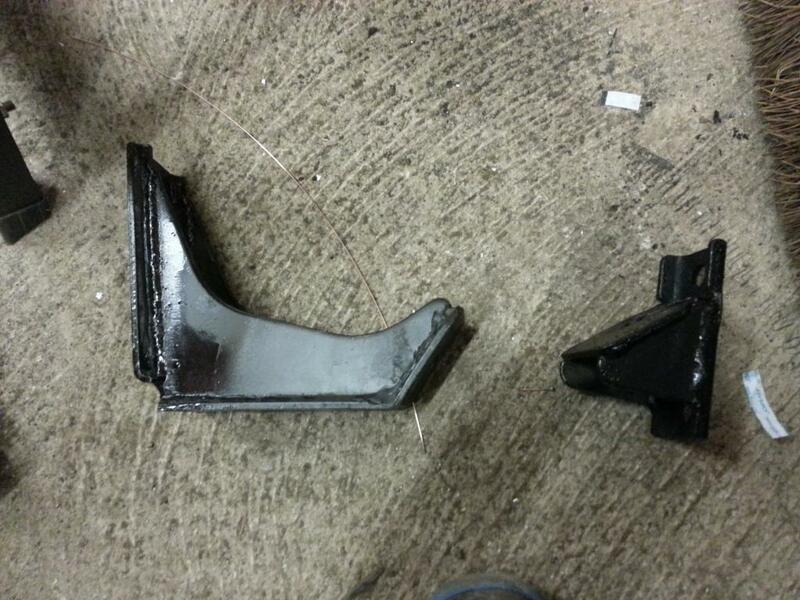 The left hand chassis rail had actually cracked all the way round just in front of the front spring hanger. To properly repair the chassis would mean almost completely stripping the Land Rover down. By the time I’d done that, I’d be as well just replacing the chassis and knowing that I wouldn’t be chasing more rust in years to come. A new chassis was duly ordered. I went for a Richards chassis, as I wanted a couple of modifications done prior to galvanising – tdi engine mounts, twin front fuel tank outriggers, oil cooler mount and a steering damper mount. 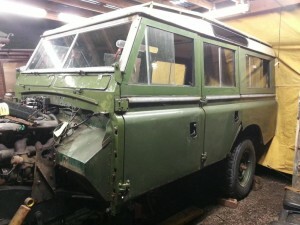 Unfortunately, while waiting for the chassis I had a bit of a bump in the Land Rover 90 I was driving at the time. 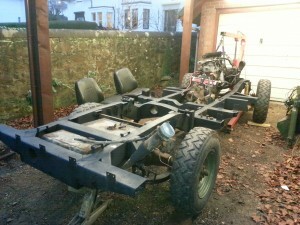 The chassis on the 90 twisted, meaning it too needed replacement. I had neither the time nor the space to do 2 chassis swaps simultaneously, and I had nowhere to store the 90 as my drive was full. This meant that I had to sell the 90. Rats. 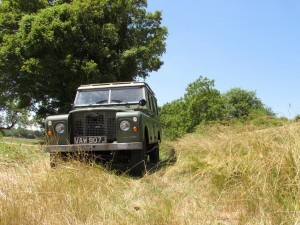 It also meant that I was now without a roadworthy Land Rover. This was decidedly uncool, so the 109 re-chassis was now top priority. The new chassis arrived soon after. It was very, very shiny. 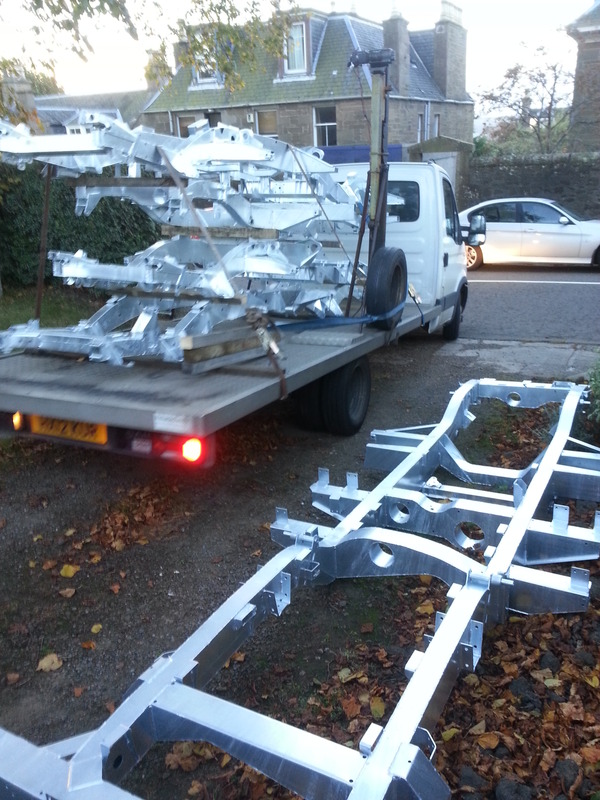 First job was to get the chassis painted, both for appearance and for corrosion protection. 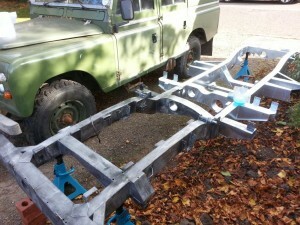 It might seem overkill to paint a galvanised chassis for corrosion protection, but it’s not really. The zinc layer on a galvanised chassis provides both a physical barrier and cathodic protection, but by painting on top of the zinc, the barrier is more effective. This means the zinc should be consumed at a lesser rate in corrosive environments (like, for example, salty British roads). The American Galvanizers Association reckon total coating life for a duplex (galv+paint) system to be 1.5 to 2.3 times the sum of the two systems lives when used independently [Ref]. That’s probably based on a better controlled paint system than me spraying some chassis black in my garden, but the principle is the same. Prior to painting I used mordant solution to age the zinc. This is an essential step if you don’t want the paint flaking off in a couple of years! The mordant solution (or t-wash) darkens the zinc so there’s a good visual clue as to whether the surface is properly prepared. Once mordanted I rinsed the chassis with water, then sprayed it matt black when dry. After that it was a case of stripping the 109 down. 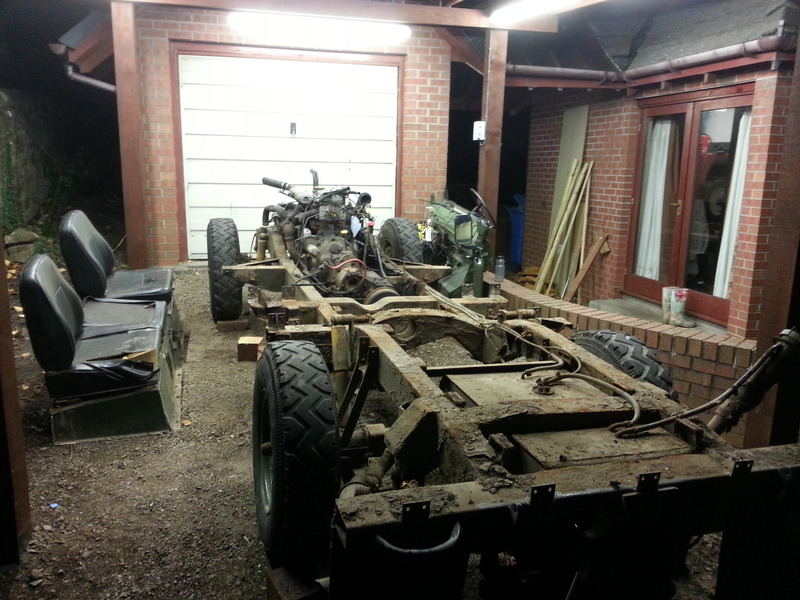 Everything went fairly smoothly (for a 44 year old Land Rover at least), and I got it to a rolling chassis in about a fortnight of evenings and weekends. 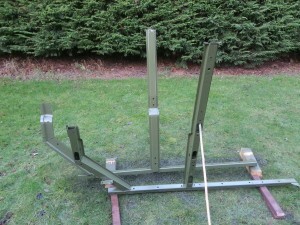 Whilst stripping it down, I decided to replace the side frames. They could have been fixed, but there’d never be a better opportunity to replace them than when it was in bits. It was then a case of swapping bits across to the new chassis. I replaced the road springs as the old ones were a bit saggy. I went with parabolics, but I have since gone back to multileafs due to a lean issue with the parabolics. For what it’s worth, the setup I was happy with in the end was RH springs on both sides of the vehicle – 276034 front and 279678 rear. 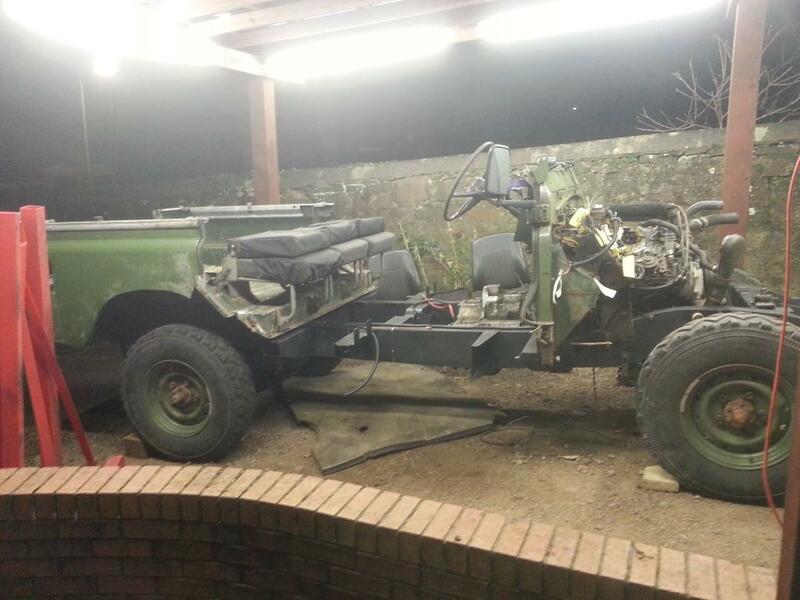 It was back as a rolling chassis in about another fortnight. I hit a slight issue when I went to drop the engine & box in. 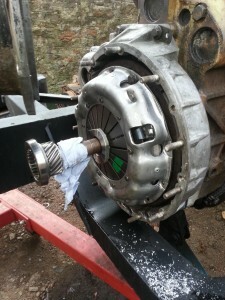 At some point, someone had replaced the original gearbox with a series 3 item. This has the slave cylinder mounted on the left hand side directly into the bellhousing, rather than externally on the right hand side with an actuating linkage. 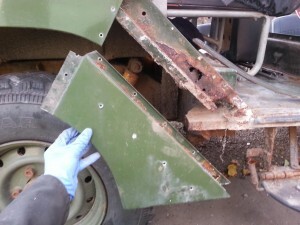 This was a problem, as the new chassis was to original SIIa specification. 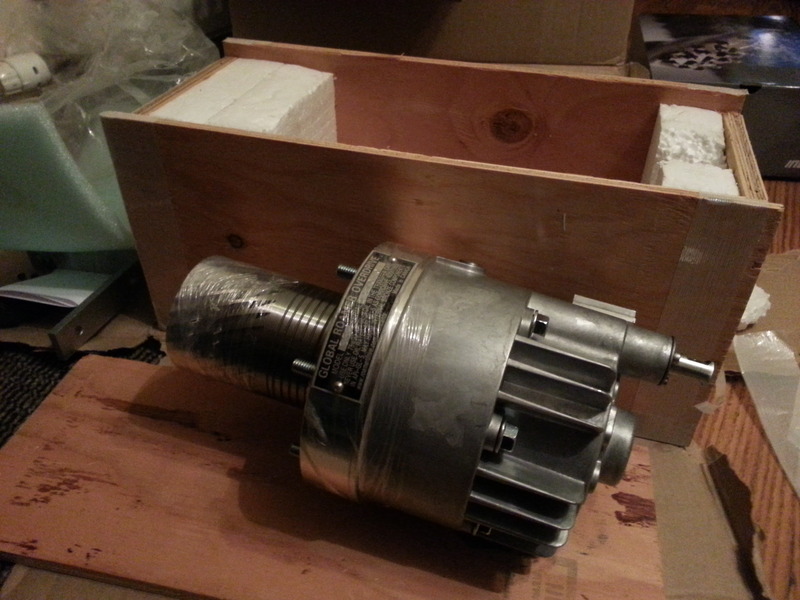 The stiffening webs on the SIIa crossmember fouled the S3 slave cylinder, so I had to source an earlier gearbox. While the box was off, I replaced the rear crank seal. 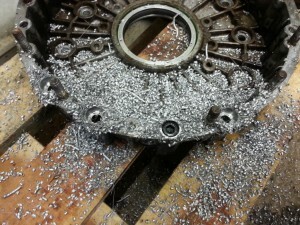 It’s not a huge job with the engine out, but would be a total pain if I had to do it at a later date once reassembled. While the flywheel housing was off to do the crank seal I counterbored the four lowermost flywheel housing-block bolt holes to accept M10 caphead screws. 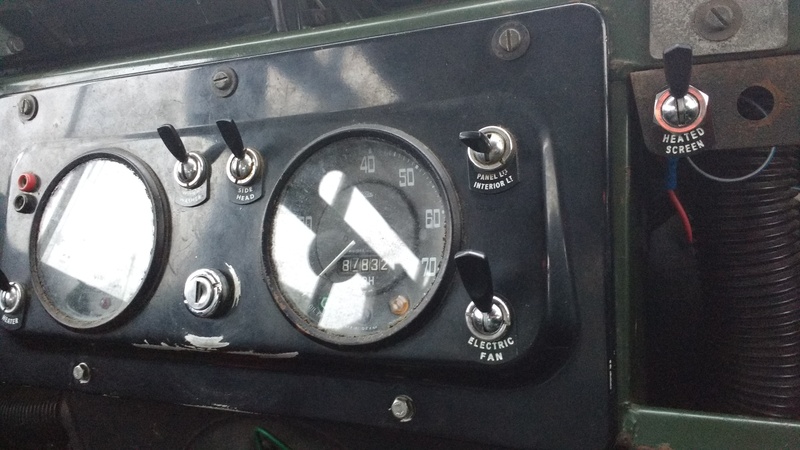 This hadn’t been done by whoever converted this Land Rover to tdi power. When fitted to an LT77, the lowermost gearbox mounting bolts go straight through to the block, sandwiching the flywheel housing in place. This doesn’t work with a series box, so in order to have the flywheel housing attached as rigidly as possible I went for the counterbore approach. One of the tapped holes in the flywheel housing was stripped, so I stuck a helicoil in to sort that out. 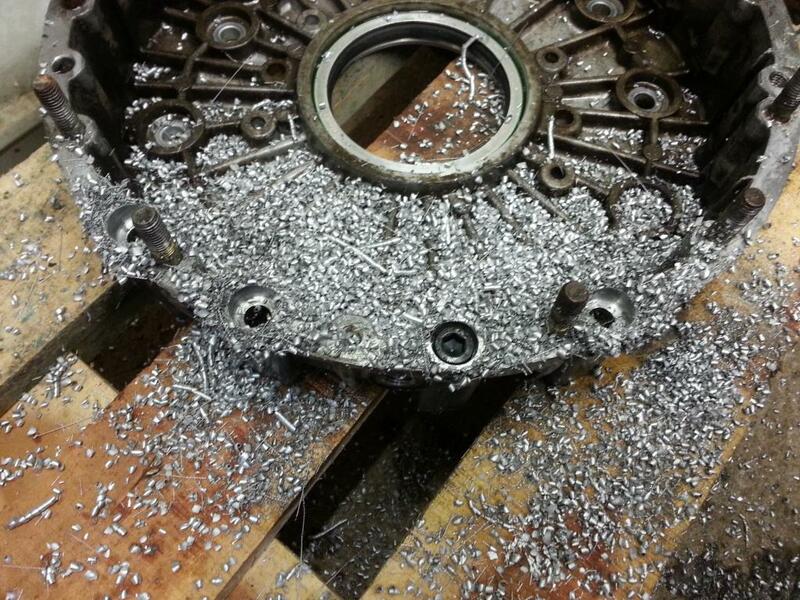 I then went to drop the engine onto the mounts, which showed up another problem. When I asked Richards to fit tdi mounts to the chassis, I mentioned that I was using a Range Rover engine, which has a low-mount turbo as per the Discovery version. I mentioned that I would need the mounts a bit higher to allow clearance for the turbo, and was told it wouldn’t be necessary. Well, they make a good chassis but they were wrong about that – the turbo interfered with the chassis rail. 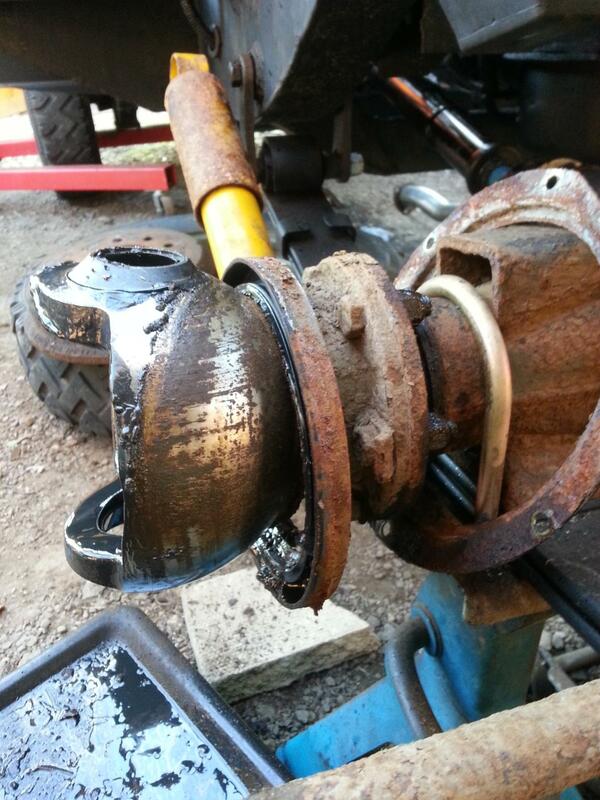 Thankfully a friend had just done an engine swap in a 90 and had a spare set of tdi/19J mount brackets. I cut and shut these to raise the engine ~10 mm. 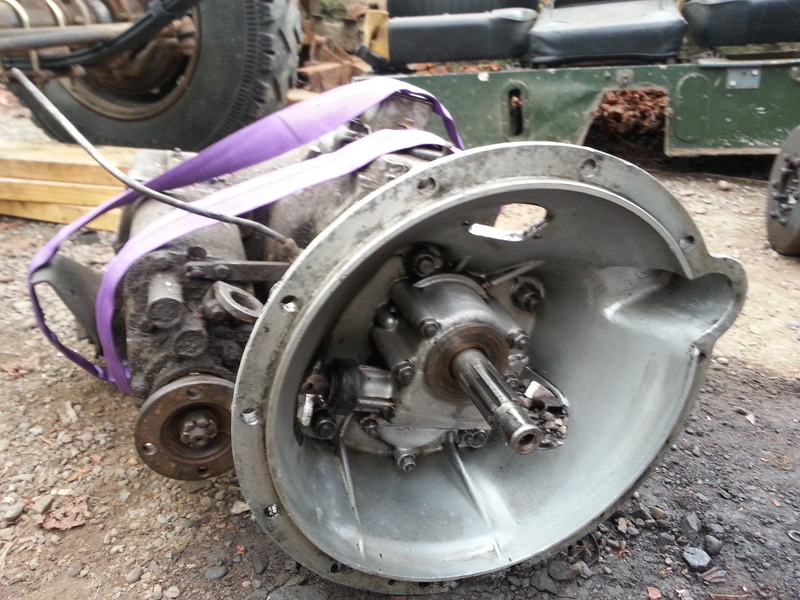 Once the engine was in, I fitted a new clutch to suit the tdi and series 2 box. 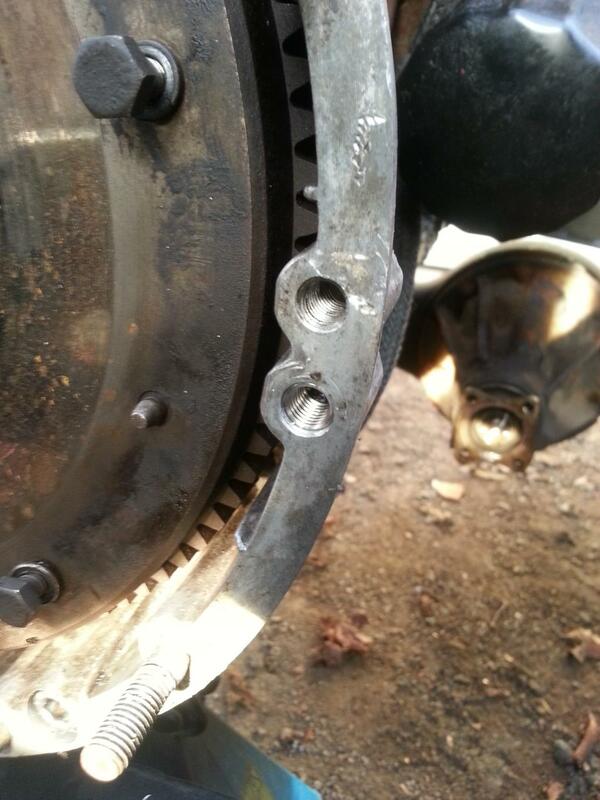 I used clutch plate 571712 (coarse spline) and clutch basket 571228. 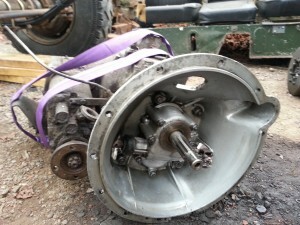 The s2 box (pictured) has a totally different release bearing setup from a later box – the release bearing is housed in the bellhousing and actuated via a linkage, rather than a conventional release fork as on later models. The clutch basket for an S11a box has a bearing plate mounted to its centre to mate with the actuation mechanism, rather than having loose fingers per a later basket. 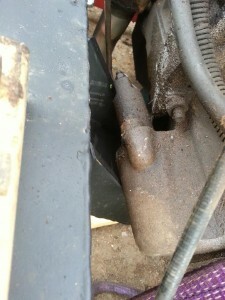 The component sticking out of the clutch in the picture is a spare gearbox input shaft. This held the plate in alignment as the basket was bolted to the flywheel. 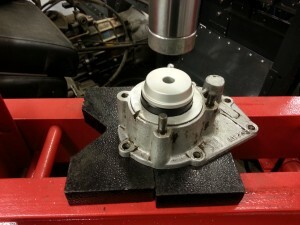 Once the box was in I took the opportunity to change the transfer box output seals. This is another job that’s much easier when you can access everything from above! 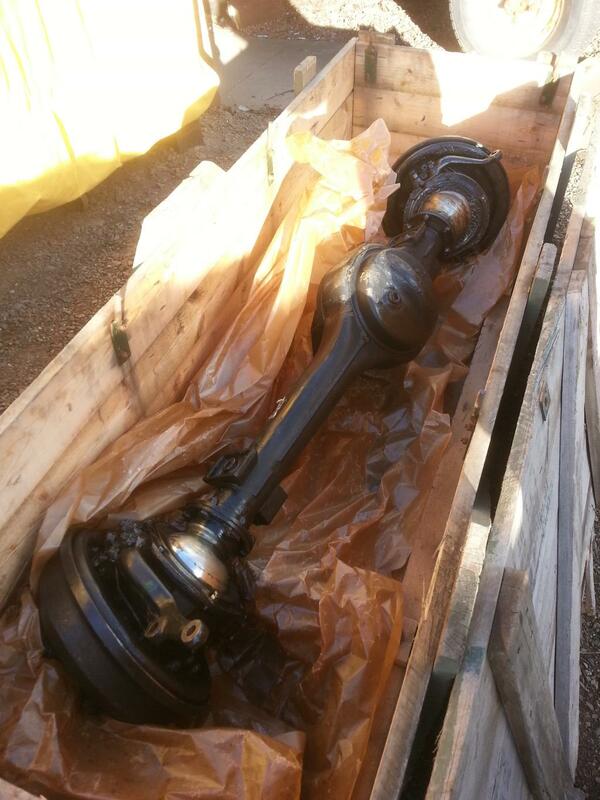 Attention turned to the front axle now, as the swivels looked decidedly ropey. 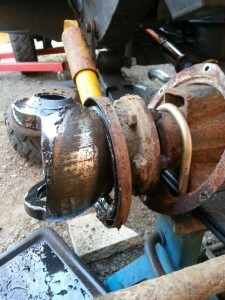 After pricing up all the parts required to overhaul the axle, it turned out to be not much more expensive to get a complete ex-mod refurb axle. In the interest of speed I went for this option. Then it was back on with the bulkhead and tub. The bulkhead and the rear of the tub cannot be raised or lowered, so all vertical body alignment has to be done relative to these fixed points. With the bulkhead in place, brake pipes and fuel lines could be finished. 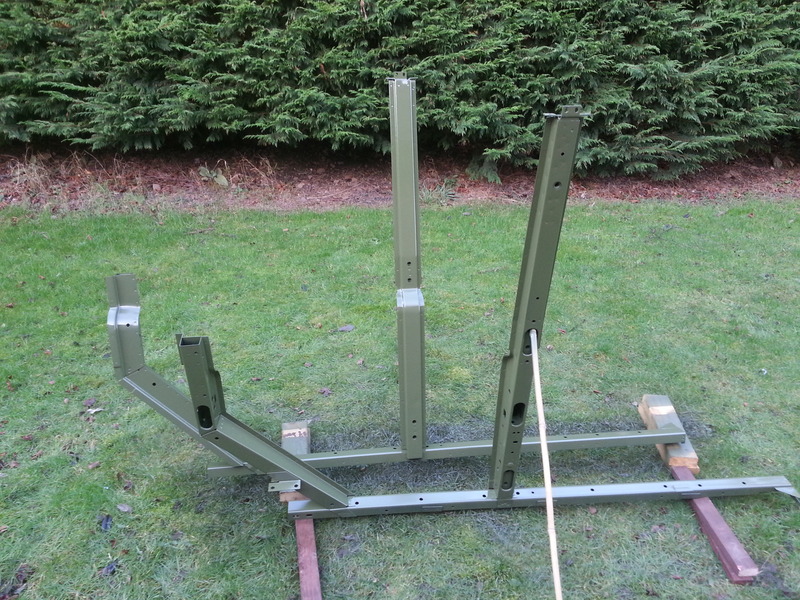 I couldn’t think of a decent way of attaching the pipes without drilling the chassis for rivnuts & p clips – not 100% happy about that, I think if ordering another chassis I would ask for these drillings to be done before galving. 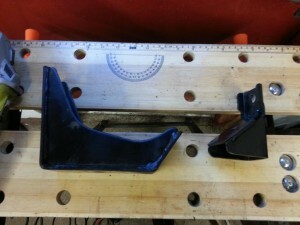 The new side frames were given a skoosh of paint and fitted. The original part numbers 333100 and 333101 were no longer available, so I had to make do with the 110 equivalents ALR5314 and ALR5315. 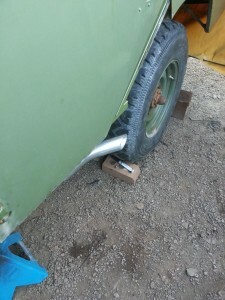 Extra holes needed to be drilled to fit the earlier door strikers, but largely it was a straight swap. 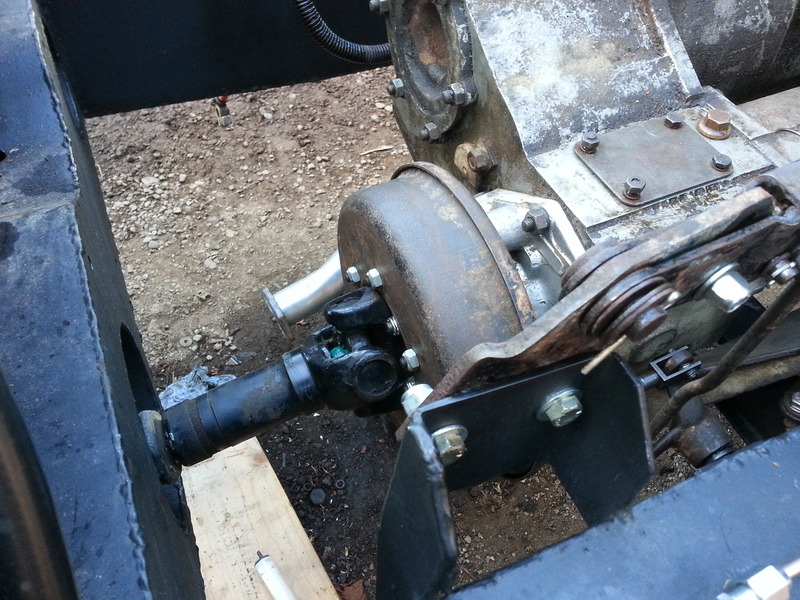 The next stage was easily the worst bit of the rebuild – body alignment. This took DAYS to get right. I ended up with about 5 ratchet straps holding everything in place while gradually tightening all of the fasteners holding the panels on. As with a short wheelbase, the trick was to run string along the ‘waist’ above the barrel sides and sort all the heights out using that as the reference. The 109 just added a few extra parts along the way which had to be aligned. The exhaust pipe which came on the 109 was a 2.25 petrol system with a modified tdi downpipe. 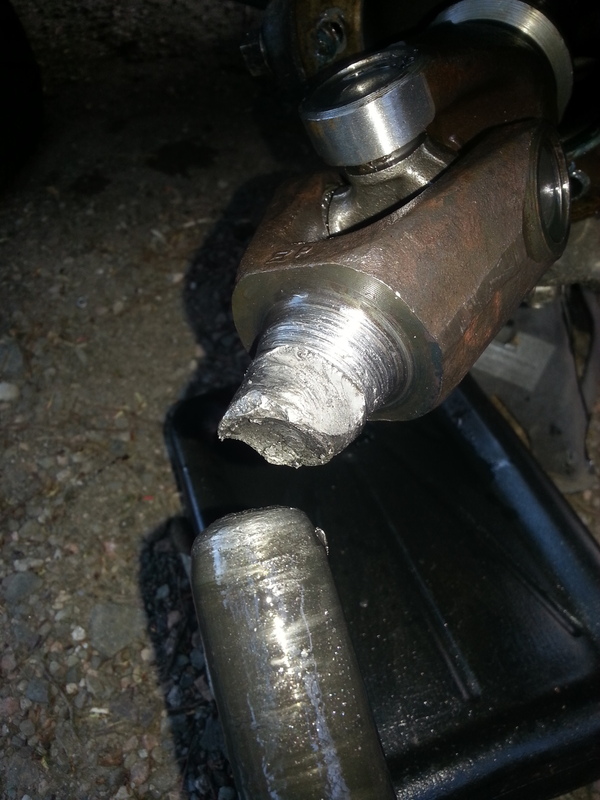 The tdi really needs a freer flowing pipe than a 2.25, so I cut up a couple of sections of a larger-bore 110 exhaust to make a straight through side-exit system. This was just to get it on the road, I later replaced it with a complete Steve Parker system. One thing I wish I had done with the engine out was change the exhaust downpipe. Doing this in-situ a few months after the rebuild was a total ballache – the manifold to turbo housing studs were all seized so the turbo had to come out. It would have been much easier with better access. Lesson learned! Once I was happy with the body alignment, the seatbox and front panel went on. One of the most satisfying moments in any rebuild wasn’t far off: She lives! Morale boosted, I cracked on with attaching the wings and finishing all the other bits and bobs. This took ages – there were loads of jobs toward the end of the build that didn’t give much visual indication of progress, but seemed to take forever. 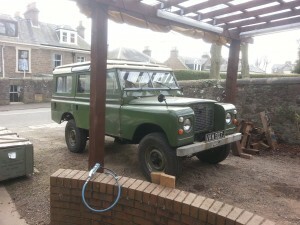 Because I didn’t know the Land Rover, I had to do a lot of regular maintenance items as well, as I didn’t know when they had last been done. 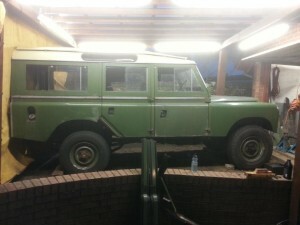 This was basic stuff like changing oils and fluids, replacing the timing belt, adjusting wheel bearings and brakes etc. I’m not one for having loads of electrics in a Series Land Rover, but I did make a couple of electrical additions. One was an x-eng fan switch, which when plumbed into the bottom radiator hose and connected into the control circuit for the Kenlowe radiator fan will switch the fan on when the coolant gets too toasty. This was hooked up to an off-on-on switch so that the fan can be set off-auto-on depending on what the conditions are. The fan has only fired up once in the past 7,000 miles or so, and that was grinding up a steep hill in the alps on a summers day. The cooling system seems to do a pretty good job without the fan most of the time. The radiator is a series item, with a 19-row Mocal oil cooler in front which no doubt restricts airflow to the rad. The intercooler is off to one side so doesn’t interfere with the rad. spaniel is sat on the middle seat – impressive! I noted in the latest LRO mag that britpart now supply these (heated screens, not soggy dogs), but it’s cheaper to get them direct from Ricky Evans Motorsport. 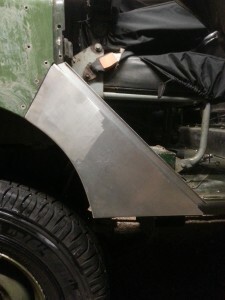 One of the last bits of bodywork to go on a station wagon is the side panel in front of the rear wheelarch. Mine were a bit ropey, and the original parts (333243 and 333244) are no longer available. I got hold of some reproduction panels from catmint, these fit very nicely and were a reasonable price. I finally got it finished on the 22nd March, and it passed the MOT first time on the 27th March – I had started at the end of October, so it was pretty much 5 months from start to finish. My goal had been to get a few months worth of driving locally to sort out any teething troubles before summer, so I was pretty happy with finishing in March. Once it had done a few hundred miles and I was happy that the gearbox wasn’t spitting teeth everywhere, I fitted an overdrive. I didn’t fancy a condition-unknown Fairey, as they’re a bit noisy and a known weak link. I ended up stumping up for a Roamerdrive (formerly Roverdrive) which has been ace. The tdi makes a hell of a racket, and this raises comfy cruising speed from not much more than 40 mph to 50-55 mph. It’s still not the longest-legged Land Rover around, but if you can handle the noise it’ll easily go faster than the speedo reads (which at 75 mph isn’t all that fast to be honest). Since the MOT she’s done around 8000 miles in 9 months – I think this is more miles than I’ve done in any vehicle in that space of time before, which is odd as it’s not best suited for long distance driving. It’s good fun though, and we took her on a 2500 mile road trip through France and Spain in June. There haven’t been many issues since the rebuild. The exhaust downpipe (not made by me!) snapped in France, but I was able to bodge it together until we got home. Because I’m a massive nerd, I tracked the buying of all the parts I needed with a spreadsheet [vaw907j rebuild spreadsheet]. It makes for slightly frightening reading, but it shows how many parts I used for a relatively straightforward rebuild – this was by no means a restoration. In fact, externally the only real clue to the work that’s been done is that the rear crossmember isn’t all rusty! 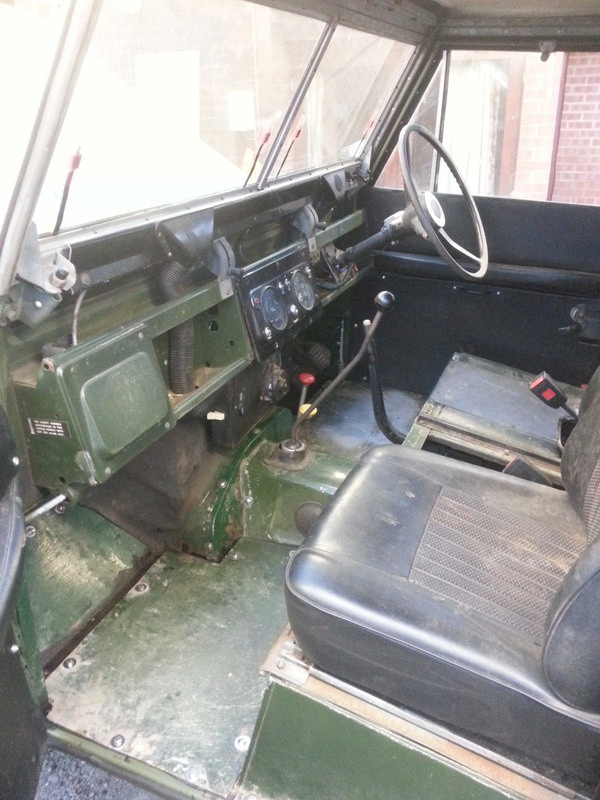 Someone who knows Land Rovers would be able to tell, but to the casual observer it’s just an old Landy. I like this – as well as being a bit more ‘subtle’ than a shiny resto job, it’s less likely to attract attention from anyone who might want to nick it. 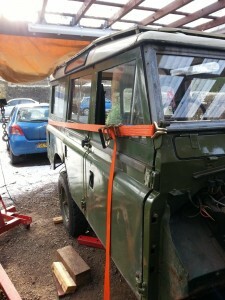 The 200tdi is the only aspect of the build that I would probably reconsider if I were to do the same rebuild again. Tdi’s are great in Discoveries and Range Rovers – they’re torquey, reliable, and fairly economical. I’d hesitate before putting one in a series again though, they’re just so noisy and vibey compared to a 2.25 petrol. It really gets annoying on longer journeys, to the point that I keep a set of earplugs in the dash for whenever I hit the dual carriageway. It’s probably less of an issue for short journeys, but I tend to only use this for longer trips. I would give serious thought to a V8 (and LPG conversion) if I were to do another series with a non-original engine – I think the relative complexity and terrible MPG would be worth it for the flexibility, the noise and the power. Also the noise. And did I mention the noise? Mmmmmmmm, V8 rumble. Excellent write up. I picked my first Series truck last weekend. All original 1967 109 Station Wagon. It came with all original rusted out metal, too. I’ll be taking the same journey you’ve written about. Thank you! Very nice, ’67 was a fine vintage. Original rusted metal is all part of it, enjoy the rebuild!